This uniquely designed strapping cart allows the operator to apply strapping both vertically and horizontally around the load. Will work with both steel and poly strapping. To use, simply engage outer detentes (disengaging inner) and turn the removable handle until strap is in the horizontal position. Once in the horizontal position, disengage the outer detents and engage the inner detents. The strap can now be raised and lowered from 28" down to 8" with the same turn handle. • Maximum core width is 5", while the minimum core width is 21⁄2". 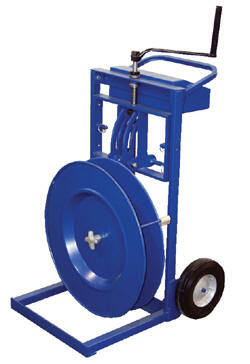 • Core diameter is 16" with a minimum of 13 3⁄4". 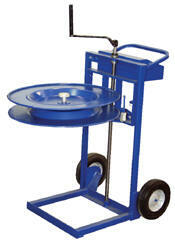 • Comes standard with 10" x 3" pneumatic wheels. 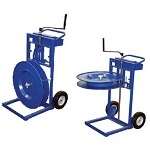 • The equipment tray measures 16"W x 51⁄2"D.
• Strapping is not included.